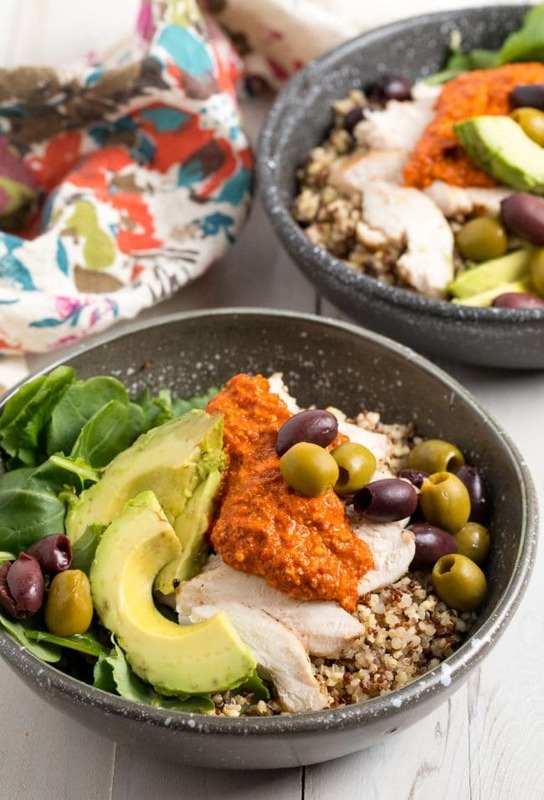 Healthy Grilled Chicken Quinoa Bowls with Romesco Sauce, olives, kale, and avocado, make a dazzling nutrient-packed dinner any night of the week! What is it about a bowl that makes every meal more inviting? Honestly… Put anything in a bowl, rather than on a plate, and suddenly it seems like a whole new dish. We may never understand the mysteries of the bowl transformation, but that doesn’t mean we shouldn’t enjoy it just the same. The key to making a good quinoa bowl is to make sure it’s well-balanced in three areas… Nutrition, Flavor, and Texture. Obviously, the quinoa acts as a nourishing carbohydrate. 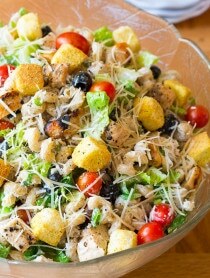 Then be sure to add in ingredients with protein, vitamins, minerals, and healthy fats. 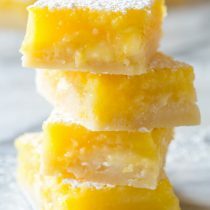 Make sure the ingredients you choice have flavors that balance each other, such as salty and sweet, bitter and sweet, or fatty and acidic. Because the quinoa is fluffy and dry, add additional ingredients that provide moisture and/or crunch. And a glorious sauce to pull it all together! 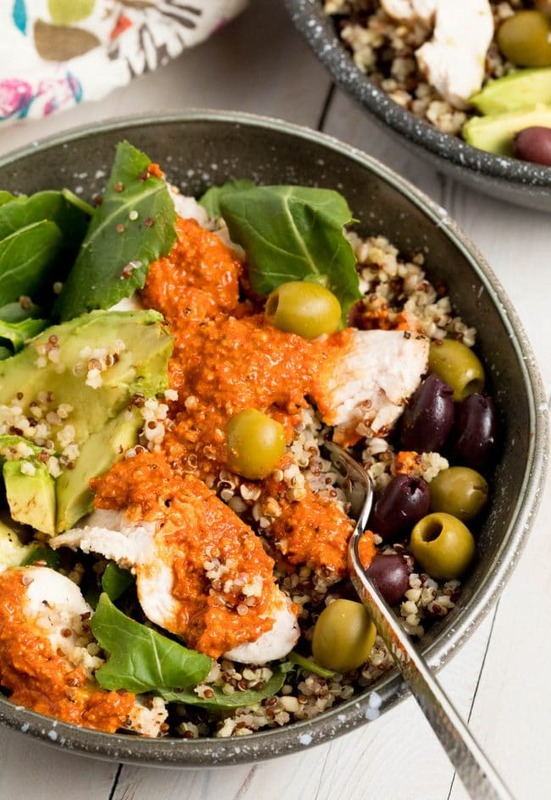 This healthy meal includes: fluffy quinoa, grilled chicken, Romesco Sauce, baby kale, avocado, and olives. Made with roasted red peppers, nuts, garlic, and sherry, the Romesco Sauce offers depth and perky essence. Plus it’s quick to make; just a few seconds in the food processor. 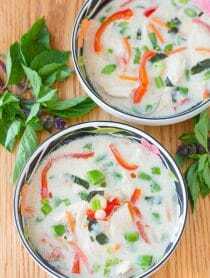 Best of all, the recipe components can ALL be made ahead for easy healthy lunchbox meals all week long! 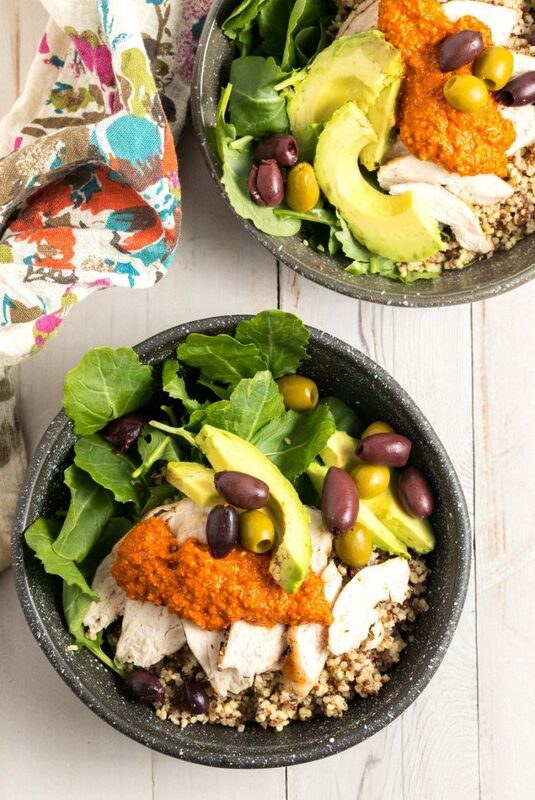 These satisfying chicken bowls are fabulous the moment they are made. Yet, surprisingly, they are just as delicious served cold, several days later. Cook the quinoa and chicken as directed. Store them in separate airtight containers in the refrigerator. 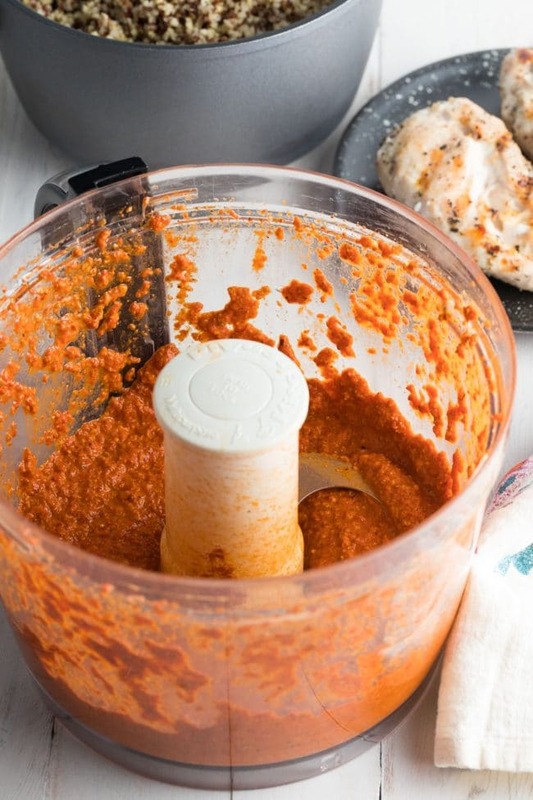 Make the Romesco Sauce and store in a third airtight container in the refrigerator. Have the baby kale, avocado, and olives at the ready, so you can package your meal the night before. 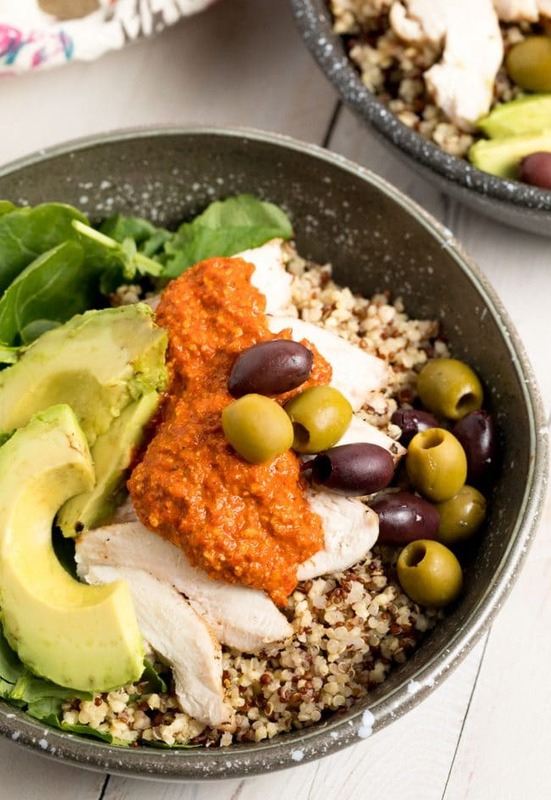 If you have multiple lunchboxes or canister and like to portion out your meals for the week all at once, make sure to: Place the Romesco Sauce on the chicken. Then place the kale on top of everything so it doesn’t get soggy, and squeeze lemon juice over your sliced avocado so it doesn’t brown as quickly. You can also wrap sliced avocado in plastic and squeeze lemon juice over it before you seal the plastic, to make the avocado slices last. Set a medium sauce pot over medium-high heat. Add the quinoa and broth. Cover and bring to a simmer. 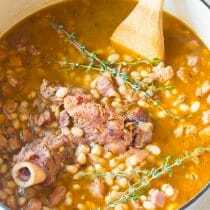 Lower the heat if needed, and simmer about 15 minutes. Then remove from heat and let the quinoa sit, covered, for another 5 minutes. Fluff with a fork. Next preheat the grill (or a grill pan) to medium. Salt and pepper the chicken breasts liberally. Once the grill is hot, grilled for 5 minutes per side. Allow the chicken to rest at least 5 minutes. Then slice. For the Romesco Sauce: Place the drained peppers, nuts, garlic, sherry, olive oil, and smoked paprika in a food processor. Puree until smooth. Then taste and salt and pepper as needed. To Assemble: Divide the quinoa between four bowls. 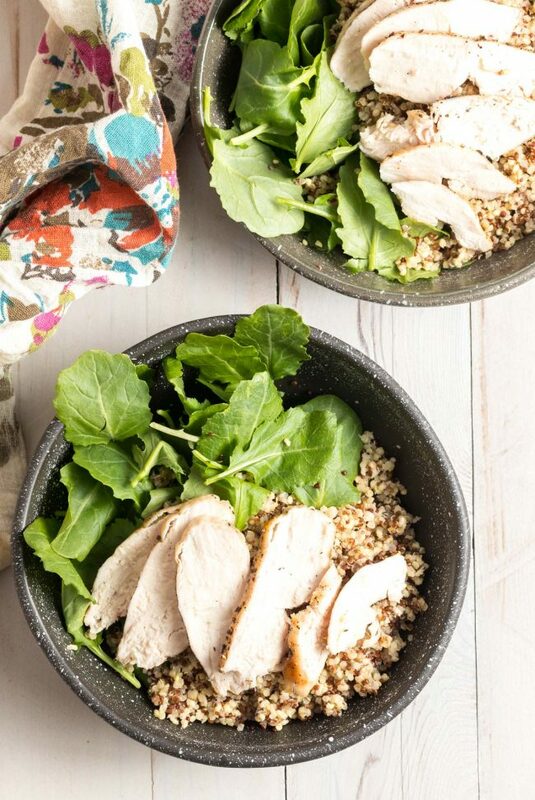 Add a large handful of baby kale to each bowl and top with sliced grilled chicken. Dollop Romesco Sauce over the chicken. Then top each bowl with sliced avocado and olives. Also try with steak or grilled shrimp! 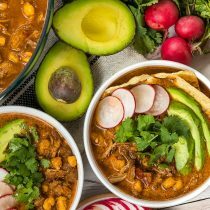 When making this ahead for lunches, do you heat any portion of the bowl or just eat it cold? I just eat it cold, but you could reheat it. Your kale greens would wilt, but it would still tastes great! 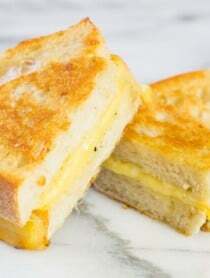 Our new favorite dinner recipe! 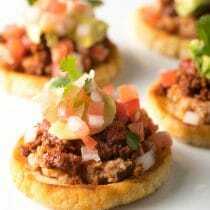 Such a great recipe for a weeknight. So healthy and filling. I will definitely make it again. My husband loved it! So good! The romesco made this so unique and delicious! 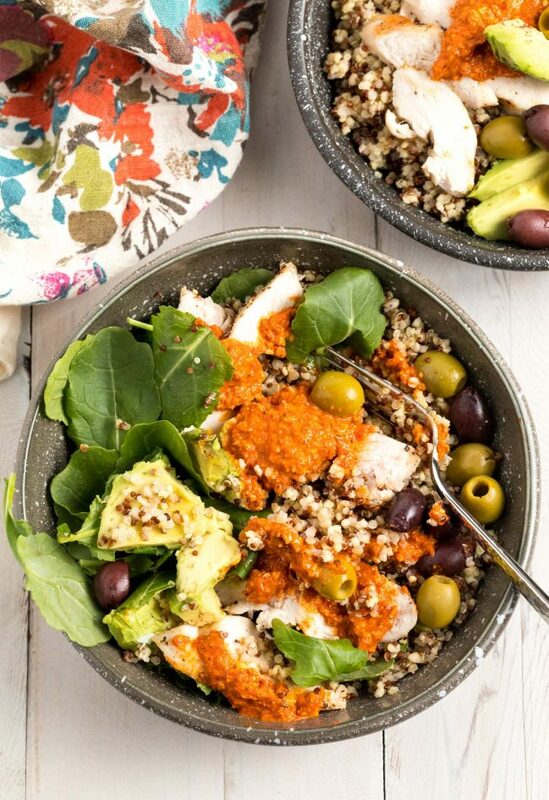 I hadn’t made romesco sauce in ages and it was terrific in this quinoa bowl!!! Could you please tell me what kind of Quinoa you use. It looks very good and I am looking forward to making this. I used a store-bought blend of classic white (brown) quinoa mixed with red quinoa. Looks delicious! What (non-alcoholic) can you use to replace sherry with? You can buy inexpensive cooking sherry at the market. However, if you want to remove it all together, I would swap it for 1 tablespoon lemon juice or red wine vinegar + 2 tablespoons water.